Contains high antioxidant level of 8.75% vs 5-6% for mass-market teas. Character: fresh and smooth with excellent depth & body. The cherry flavoring and subtle rose hints give it an exotic character. Cherries, particularly the Montmorency cherry, have a distinctive taste and explode with rich sweet flavour when combined with tea from Hunan and subtle rose. Generally recognized as a rich source of antioxidants. Hunan Province produces some excellent Japanese style sencha green teas. Early in the new season the tea is a bright emerald green and has the best flavor noted by a spring fresh character with pungency and body. 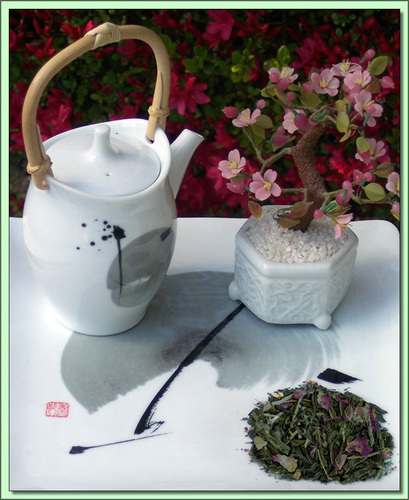 Flavored tea is a relatively new phenomena and combining flavors with roses and Japanese style green tea is almost considered avant garde by our Japanese friends. Organic tea is produced without the input of chemical fertilizers or pesticides and herbicides. Certified Organic by QMI Organic Inc. Certificate #: 150 - 2008. USDA Certified Organic.